Floral Sterling Silver and Amethyst Jewelry Set, "Falling Leaves"
Silver branches host lilac leaves that fall in a dazzling cascade. Handcrafted, this set by Neeru Goel features the sparkling allure of faceted amethysts. Three lavish fronds center the sterling necklace, while matching earrings complete the ensemble. 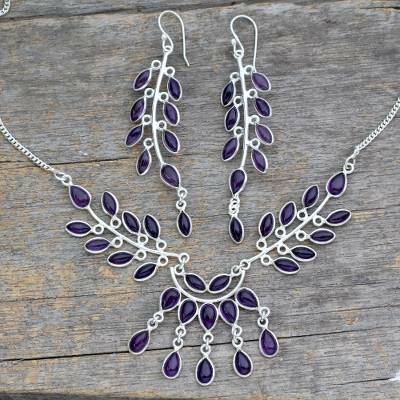 You can find amethyst jewelry set 'Falling Leaves' by Neeru Goel in jewelry categories such as Birthstone Jewelry Sets, Floral Jewelry Sets, Amethyst Jewelry Sets, Silver Jewelry Sets, Sterling Silver Jewelry Sets and Link Jewelry Sets. Enjoy exploring these sections for other Novica treasures. I love vthe detail in this matching amethyst jewelry set! "My Wife loved this set!!" Well made, well packaged and a beautiful design!!! Thank You!! !